Is it okay to post almost three months late? Probably not. I just haven't had the time to really pound this one out. The kids take all my time. The SF Giants take all my time. Well, tonight they are losing Game 6 of the World Series against the Kansas City Royals and this gamer babe's not happy. So I turned it off and went to my computer. Can I go back to Hawaii? There are places on this earth that experience a lot of hurricanes. Hawaii is not one of them. When a hurricane hits Hawaii, everyone knows about it. Most everyone can recall Iniki and Iwa, the two ladies that wracked the islands in 1992 and 1982. For the most part, Hawaiian residents don't really have too much experience with hurricanes. Tack onto that fact that at any given time during the summer half of those on the islands are tourists, and you've got quite a collection of novices. So it came to us as quite a surprise when I learned Tuesday morning, while shooting at Kauai Eco Clays, that Hurricanes Iselle and Julio were headed for Kauai. We were like, whatevs. Tuesday afternoon we had to go to Costco in Lihue for nothing related to weather. The place was a veritable zoo. Seriously it looked like the Almaden Valley Costco the Sunday before graduation and Fathers' Day. The line to check out was backed up to the bakery. Craig got in line while I ran around to get the few things we needed. What were all these people buying? Then off to the gas station, where the line was literally around the block. It looked like the Bay Area in the 1970's! No getting gas now! We'll come back later! Sometime Wednesday we got a notice from the hotel telling us to prepare for a hurricane due to arrive by some time Thursday by purchasing non-perishable food and water to last our family three days. We had some food, but not enough for three days and not all of it non-perishable. About this same time I got a call from the owner of the rental property in Hanalei we were headed to Friday asking if we were still coming and filling us in on emergency readiness. We looked at the bright blue sky and the weather report which kept pushing out the time of the storms arrival. We shook our heads and waltzed off to the pool. But, here is where the panic began to ensue for my parents, OK, mostly my dad, who flew into an outpouring of 'what if's. What if there is there's no electricity? What if there's no water? What if we can't leave the island Friday (they were leaving Friday)? Where will we stay (ok, not really a 'what if')? What are we going to eat (a big one for my dad)? What are we going to drink? Feeding into the frenzy or even becoming impatient with it wasn't going to help anything, so I told him everything would be fine and not to worry about it anymore. That must have helped because he didn't bring it up again. The hurricane that was supposed to wallop the island of Kauai on Thursday never materialized. We went to the beach all day. At night, we drove to Kekaha Beach on the west side of the island and watched the clear sunset. We went to dinner at Wrangler's Steakhouse in Waimea, who were going to be closed the night day for the impending hurricane. At seven the next morning, a few clouds and some wind had begun to appear . Something made me nervous about going for a walk and getting caught in the rain but then I decided to go anyway, and no, I didn't get caught in a storm. But not long after it became pretty evident that something was coming. The rain came and the palms trees started to rock, first a little, then quite a bit more. We had a whole day's worth of activities planned, including mini golf and renting cruisers to bike along the Kapaa beach path, but by the time we had to be out of our room at 10am, it was clear these events were not going to take place. We couldn't check into our rental in Haena until 4. What ARE we going to do today? Our friends, the Vernales, were in the same boat and were staying in the same place, so we trekked over to their room and watched the Little League World Series for a while. Well, it's raining in Hawaii...what else are you going to do? My parents flight was due to leave at 10:15 am. We got no call, so evidently the plane got off the ground. Travel was not unaffected though! My poor friends, the Mehlbergs, who were only coming for a week, had their flight into Kauai delayed one and a half days! Well it was time to move on..we decided we were going to shop. First it was off to the Poipu Shopping Center to stop in at Crazy Shirt and Starbucks. Lots of businesses were closed or closing early, including Starbucks, which was closing at three. This is when the storm began to unleash its fury. If I can figure out how to attach video to this blog I will, but it was nasty wind and rain. People were huddled under the awning, usually used for protection from the sun I would imagine, covering and dashing only when completely necessary. The lights flickered in the Whalers' General store as I stood in line to checkout. Craig had bought a shirt at the Koloa Rum Company that fit weirdly and he wanted to return so our next stop was at the gift shop at Kilohana Plantation. The Kilohana Plantation is between Lihue and Poipu, and is home to the Koloa Rum Company, the Luau Kalamaku, and a lovely courtyard restaurant, Gaylord's...but not today. The entire plantation was closed. Now we are stuck with that shirt. We also wanted to buy Koloa Rum, but not at the gift store prices! So off to Costco across the street--uh, no one here now in this weather! Natalya was on a quest for chocolate covered macadamia nuts and I needed a gift for work. We strolled the empty aisles looking for bargains. The Koloa Dark Rum was far cheaper at Costco so we bought that and some candy and were on our way. We went to Hilo Hattie, but did we buy anything there? Gosh, by now we were starving! But downtown Lihue was a ghost town! We looked in our little blue book (see my last post) and decided on the Garden Island BBQ. It was kind of a cross between local and Chinese but looks Chinese. It is located at 4252 Rice Street, and is open 10am-9pm except Sundays, when it's closed. Anyway, it was one of the only open businesses in Lihue, so we went for it. The wild thing about this place is its menu of 150 items including more than 30 choices of plate lunches! You can get a mini (with one scoop of rice and 1 scoop of macaroni or kimchee) for about $6.50 or a regular with twice the rice for $7.95. The mini is plenty!! The other great part is the price. We paid $41.36 total for 5 of us and we were stuffed. The most expensive thing on the menu was a $11.95 seafood hot pot and on the flip side there's a $2.50 hamburger. Hey, better than starving! Of course we had to stop at the bathroom, so we stopped at Lydgate State Park. It was raining but beautiful. We strolled out to the beach to check out the pounding surf. We had a few more stops, successfully buying the chocolate macadamia nuts and off to the North Shore we went! Our plan was to check in at our house (which we had discovered was at the end of a one way gravel road a few days earlier) and head over to the Mediterranean Gourmet, a relatively new restaurant at the Hanalei Colony Resort in Haena, for happy hour. We got into the house without incident. The house was on ten foot stilts with a wrap around deck, open air windows (no glass), and a completely separate master suite. On any given day the most notable feature might have been quite appealing, but during a hurricane, the fact that the house sat on the banks of the Wainiha River was not not so appealing, actually it was scary. Rivers rise during heavy rain. The tricky thing about the Hanalei area is the Hanalei River. If the Hanalei River rises high enough, the Hanalei bridge will close. If the Hanalei Bridge closes and you are on the other side, you are cut off from the rest of Kauai. Well back to our little river. We didn't really know how much it was up, but it was up and moving swiftly. We drove out to the Mediterranean Gourmet for happy hour and found the place locked and boarded up for the hurricane. Dagnabbit! Turn around and head back to Hanalei town to try to take advantage of Kalypso's happy hour. Well great. Kalypso's happy hour ended at 5:30. Lots of Hanalei restaurants were closed, Bubba's Burgers, Tropical Taco, Hanalei Gourmet...we were stuck eating non-happy hour priced happy hour food at Kalypso. We were seated at an open air table, protected by awnings only. By the end of the meal, my back was soaked. While in Kalypso eating greasy appetizers and drinking weak drinks, the weather got significantly more hurricane, necessitating our dash back to the car in a tropical downpour. One more stop at the Big Save was needed, where we bought a sale priced bottle of Kauai Gold Spiced Rum we had been searching all over town for! We tried to stop by Kee Beach to watch the sunset, but yet another failure. Not only was the beach closed, the stream that usually trickles across the road had risen to a point that the road was impassible. We didn't dare risk it. We sadly turned around and headed home. We turned down the dark single lane dirt road in the pouring rain and wondered what awaited us at the end. Well, not quite at the end, we ran into a utilities truck that was working on clearing vines off the power lines. Not a great sign! Anyway, they offered us no information, but rather let poor Craig come to them in the deluge. He learned that they needed 15 minutes, and that we might have power, and we might not. What was having no power going to mean? Well for tonight it was going to mean we were going to have to scrounge around in the dark looking for emergency equipment. Worse was that with no power there was no phone, no router, and no cell service. With a river rising rapidly next to us, we had no way to contact, OR be contacted by the outside world. We had power, gratefully. There was enough light from the house to see the little Wainiha River had risen to about three feet from the banks. Sleeping was scary. The rain pummeled down hard on the roof. We had no idea if and when we were going to lose power. At about 11 o clock we were awakened from sleep by a phone call on the landline! What? Anyway, it was an official flash flood warning for the Hanalei River, in affect until 2 in the morning. After that Craig got up every two hours to check the river. The sunrise came with great relief. Though still cloudy, the rain had stopped and the banks had not overflowed. Businesses slowly emerged from beneath wet plywood as rivers receded. The north shore was a mess. Beaches and hiking trails remained closed. Shores were awash with murky leaf filled water, run off from the mountains above. A river ran through Haena Beach where only a few days before the boys had played baseball on a dry hot sandy beach. 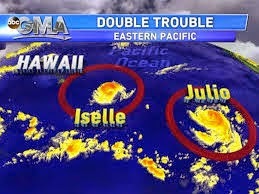 Hurricanes Iselle and Julio had passed us and Kauai by. We didn't wash or blow away, and we ate, drank fresh water, and had gas and electricity the whole time. We wound up leaving the full jar of peanut butter and the bread we had bought for a small fortune at the Big Save in the rental house. We dumped all of our saved water down the drain. Big warnings turned out to be not much of an adventure after all, but they did make for some interesting moments! Thank you for reading this post! Now I go to Disneyland for some Holiday fun in November! Stay tuned to hear about it!